1. Remove the white centre of the cabbage and cut into thin slices. Put into a sieve and rinse thoroughly. Then sprinkle salt over the cabbage. 2. Gently squeeze the cabbage and put aside for 30 minutes. 3. Meanwhile mix all other ingredients together for the dressing, then pour over the cabbage. 4. Place in the fridge and keep until the rest is ready for serving. The longer you leave it soaked in the dressing, the nicer it will be. 1. Drain the chickpeas but keep the water in a mug separate (you’ll need it for the aioli later). 2. Pour the chickpeas into a food processor and blend until smooth. 3. Peel the garlic and add to the processor along with the peanut butter. 4. Squeeze half a lemon over the mixture. 5. Add all remaining ingredients and whizz to a smooth paste. Put aside. 2. Boil some water according to the instructions and pour in the falafel mixture. 3. Stir well and put aside for at least ten minutes. 4. Using two spoons, form little balls and place on a baking tray. 5. Bake for twenty minutes or until golden brown. 1. Wash the tomatoes and cucumber. 2. Half the cherry tomatoes and quarter the cucumber, then mix in a bowl with the seasoning. 1. Add the aquafaba, vinegar, mustard and salt to a food processor and blend for a few seconds until everything is combined. 2. Keep the blender running on a low level and very gently and slowly drizzle in the oil. Do not add everything at once or too fast or the mixture will split. 3. Stop blending when the mayonnaise suddenly turns thick – you may not need to use all the oil. 4. Squeeze over the lemon juice, stir in the garlic and season to your taste. 1. Place a large frying pan on the hob and quickly heat up the wraps. This only takes a few seconds. 2. 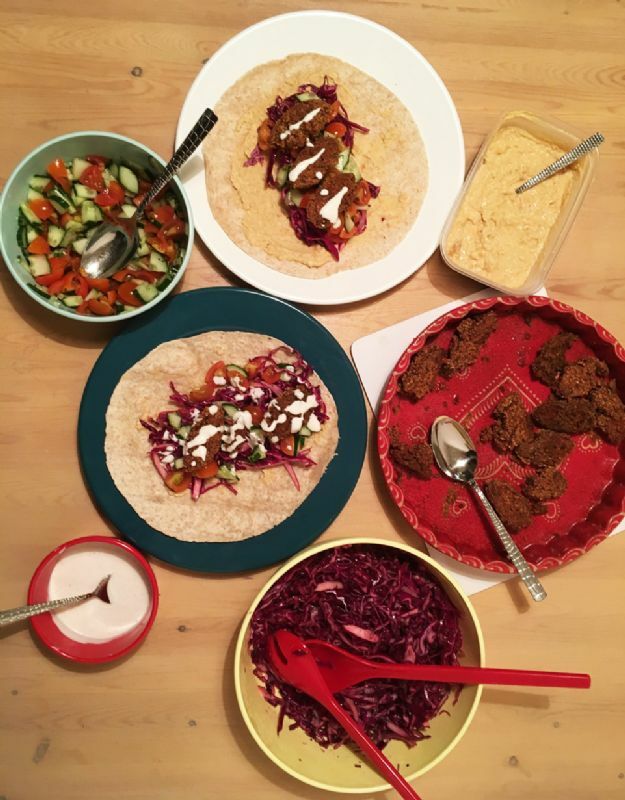 Spread the hummus on the wrap and then assemble it, using the salsa and the cabbage. 3. 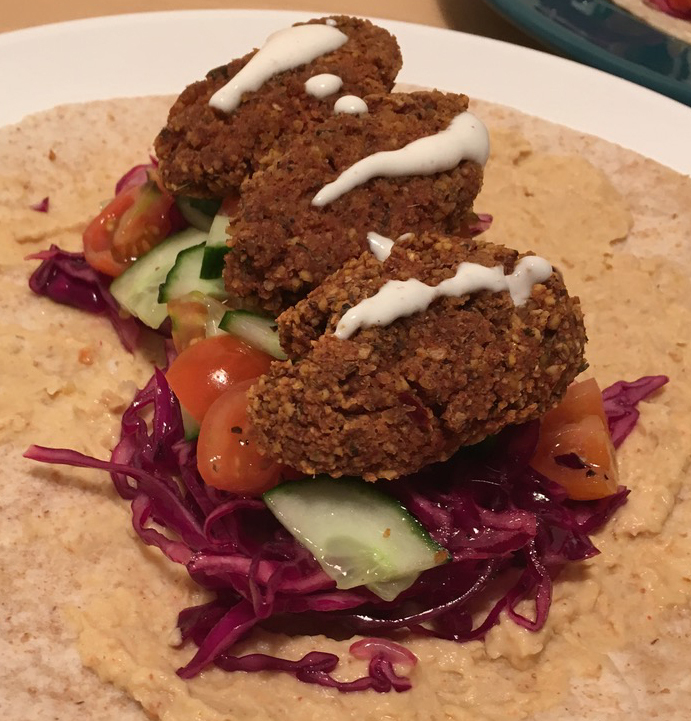 Cut the falafels in half and place them on top of the salsa and cabbage. 4. Drizzle over the aioli, fold in the sides and voila! Tip: To speed up the recipe you could use shop bought hummus and garlic aioli.